The Sixth Episcopal District—Savannah District African Methodist Episcopal Church and Bryant-Buchanan Productions, Inc. presents two-stunning comedy shows March 15th, 2014 at 1pm and 6pm at Cavalry Baptist Temple, 4625 Waters Ave, Savannah GA 31404 featuring Gospel legend, Vickie Winans as comedian and Gospel singer. Special guest performers will also include Barbara Carlyle of BET Comic View, Def Comedy Jam and Apollo Comedy Hour Comedy, and Attorney Rod Allison as Rod of God from Atlanta, Georgia—lawyer by day and comedian by night. Tickets are on sale now to see Vickie Winans and friends for a night of comedy, singing and more. 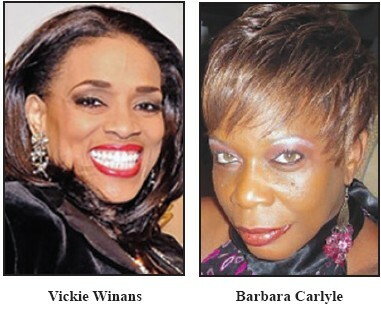 The first 100 online purchasers will receive VIP seating and get to meet Vickie Winans at reception prior to show at 11:30am-12:30pm, March 15, 2014. The Savannah District AMEC and BBPI will also present 20 Free Seats per show for Combat Veterans and families by rsvp only. For more information call (913) 704-9258. Tickets are available online at www.NightofLaughter.net for $35. Tickets can also be purchased at the Garden of Eden Restaurant on Martin Luther King, Jr. Blvd. and It’s Amazing on 37th Street and Waters Ave. Ticket prices at the door will be $38. Other featured comedians: Willie Knight of Glennville, Georgia; Twanna Kelly with her puppet Joy from Fort Gordon, SC. Featuring Sharon Buntin of Eatontown, NJ as world-renowned praise and worship minister and a medley of worship artists from Bryant Buchanan Productions, Inc. Breanna Crawford, Yosha Jackson, Ashley Gaulden, Minister Crawford, Pastor Harvey G. Buchanan, Jr. along with TJMusic22, LLC.